Membrane proteins are designed to fold and function in a lipid membrane, yet folding experiments within a native membrane environment are challenging to design. Here we show that single molecule forced unfolding experiments can be adapted to study helical membrane protein folding under native-like bicelle conditions. 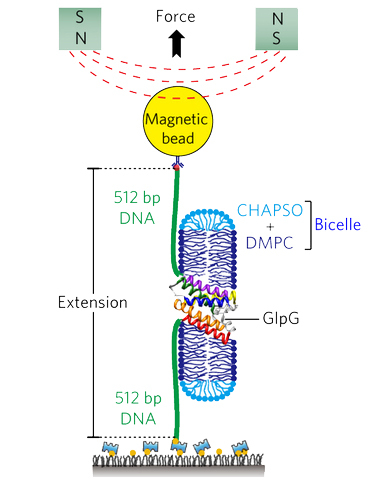 Applying force using magnetic tweezers, we find that a transmembrane helix protein, E. coli rhomboid protease GlpG, unfolds in a highly cooperative manner, largely unraveling as one physical unit in response to mechanical tension above 25 pN. Considerable hysteresis is observed, with refolding occurring only at forces below 5 pN. Characterizing the energy landscape reveals only modest thermodynamic stability (DG = 6.5 kBT) but a large unfolding barrier (21.3 kBT) that can maintain the protein in a folded state for long periods of time (t1/2 ~3.5 hrs). The observed energy landscape may have evolved to limit the existence of troublesome partially unfolded states and impart rigidity to the structure. “Protein aggregates associated with neurodegenerative disease have stubbornly resisted researchers’ efforts to get a good look at them. They refuse to crystallize well or yield to standard spectroscopic techniques. Now, advances in electron microscopy methods are forcing these molecules to give up their secrets. 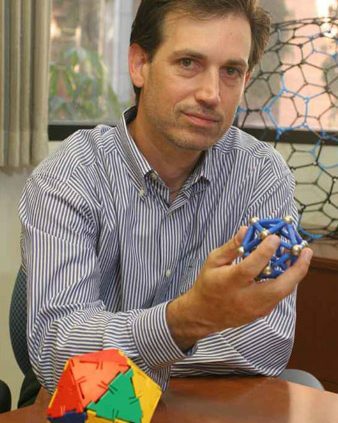 In the September 9 Nature, researchers led by David Eisenberg at the University of California, Los Angeles, and Tamir Gonen at the Howard Hughes Medical Institute’s Janelia Research Campus in Ashburn, Virginia, offer the closest look yet at the core of α-synuclein aggregates. The researchers made microscopic crystals from the peptides and used a relatively new technique called micro-electron diffraction to map them down to atomic resolution. Commenters called the work a tour de force. Diffusion accessibility as a method for visualizing macromolecular surface geometry. Published in Protein Science, Oct 2015. Important three-dimensional spatial features such as depth and surface concavity can be difficult to convey clearly in the context of two-dimensional images. In the area of macromolecular visualization, the computer graphics technique of ray-tracing can be helpful, but further techniques for emphasizing surface concavity can give clearer perceptions of depth. The notion of diffusion accessibility is well-suited for emphasizing such features of macromolecular surfaces, but a method for calculating diffusion accessibility has not been made widely available. Here we make available a web-based platform that performs the necessary calculation by solving the Laplace equation for steady state diffusion, and produces scripts for visualization that emphasize surface depth by coloring according to diffusion accessibility. The URL is http://services.mbi.ucla.edu/DiffAcc/. https://www.doe-mbi.ucla.edu/wp-content/uploads/2015/08/mhc_after_sml-1.jpg 180 180 DOE-MBI Staff /wp-content/uploads/2014/11/institute-300x84.png DOE-MBI Staff2015-10-01 00:40:092015-10-01 00:40:09Diffusion accessibility as a method for visualizing macromolecular surface geometry. In a new PNAS article, members of the UCLA-DOE Institute, Andrew AhYoung, Pascal Egea, and Joseph Loo, together with Jiansen Jiang, Jiang Zhang, and Hong Zhou, have offered further elucidation on the structure and function of the conserved SMP domains in the ERMES complex. 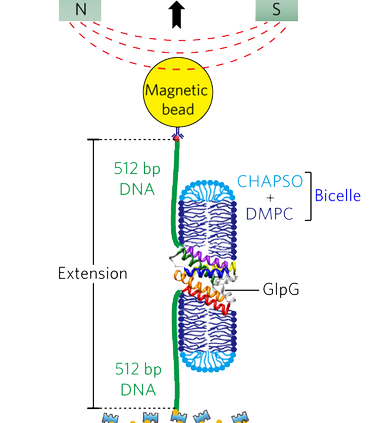 The new article asserts the roles played by conserved SMP domains of ERMES in the tethering of mitochondrial and endoplasmic reticulum membranes and the essential exchange of phosholipids, such as phosphatidylcholines, between the two organelles. 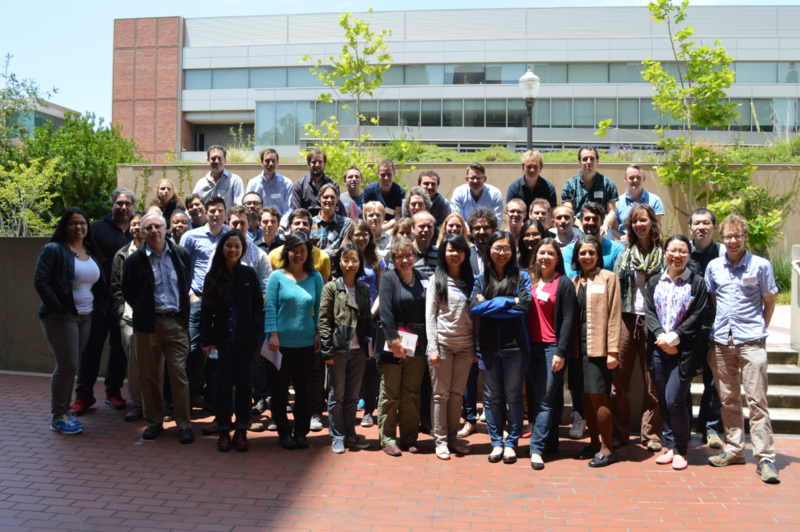 On September 14, 2015, the UCLA-DOE Institute of Genomics and Proteomics will host a 1-day minisymposium on Frontier Problems and Technologies in Bioenergy and Biodesign. The symposium aims to expose the UCLA campus and nearby research communities to important new energy-related research and technology developments. A number of leading investigators will discuss their latest work. The prize was established in memory of Warren Lyford DeLano, who developed PyMOL, an open source molecular viewer software and was an advocate for open source practices in the sciences. Previous winners of this prestigious award include Vijay Pande, Michael Levitt, Helen Berman, Barry Honig and Axel Brunger. Todd is recognized for his multiple, profound contributions to computational biology. 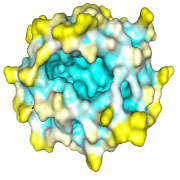 These include: methods to design large, open protein shells capable of encapsulating cargo; methods to infer protein interactions from genome sequences; a powerful method to detect errors in protein structures; and a method to detect twinning which often bedevils protein structure determination. UCLA-DOE Institute to support UCLA’s iGEM team (International Genetically Engineered Machines) in the 2015 annual competition in Boston. The main program at the iGEM Foundation is the International Genetically Engineered Machine (iGEM) Competition. Click here for more information. https://www.doe-mbi.ucla.edu/wp-content/uploads/2015/07/Igemlogo_officiallogo-1.jpg 390 480 DOE-MBI Staff /wp-content/uploads/2014/11/institute-300x84.png DOE-MBI Staff2015-07-14 18:32:202015-07-14 18:32:20UCLA-DOE Institute to support UCLA's iGEM team (International Genetically Engineered Machines) in the 2015 annual competition in Boston. 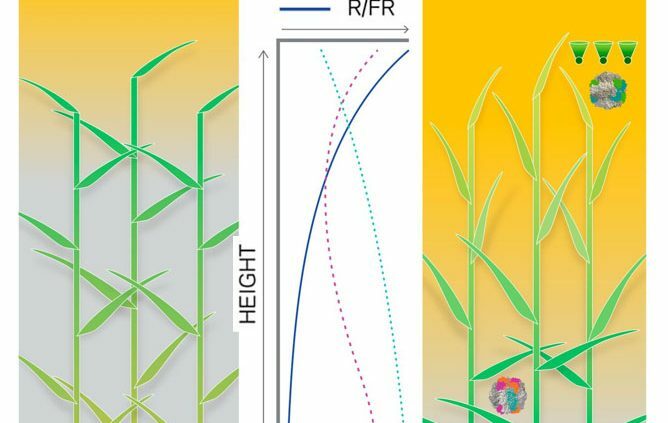 UCLA-DOE researchers and their colleagues publish new ideas for redesigning photosynthesis to meet global food demand crisis. 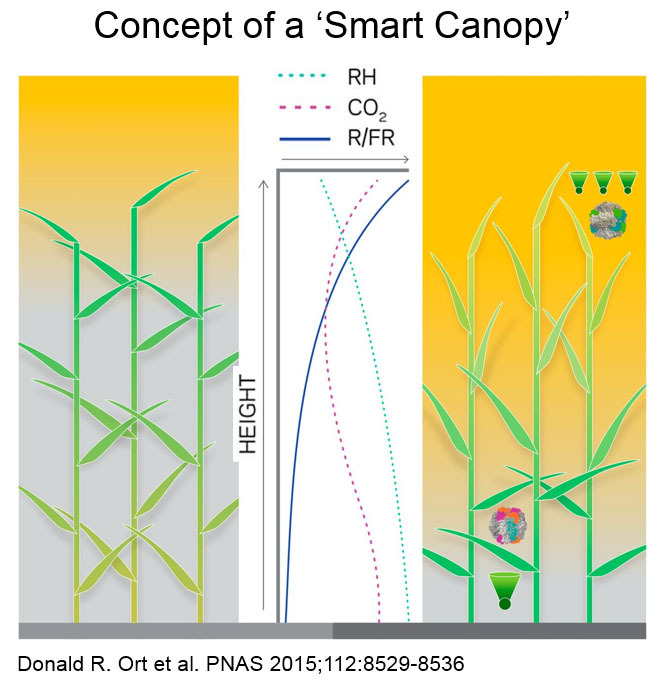 https://www.doe-mbi.ucla.edu/wp-content/uploads/2015/07/smart_canopy-1.jpg 683 668 DOE-MBI Staff /wp-content/uploads/2014/11/institute-300x84.png DOE-MBI Staff2015-07-14 18:24:372015-07-14 18:24:37UCLA-DOE researchers and their colleagues publish new ideas for redesigning photosynthesis to meet global food demand crisis.